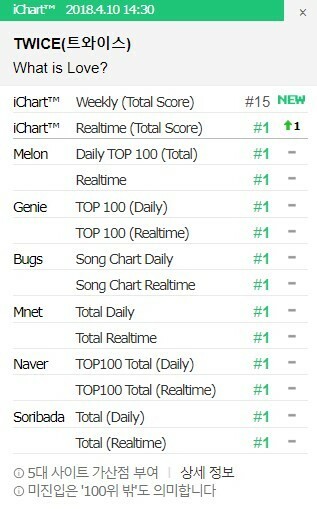 TWICE's 'What is Love' achieves certified all-kill! TWICE's latest release 'What is Love' has achieved a certified all-kill on the instiz iChart! Once again, the girl group are topping music charts, and less than a day after its release, "What is Love" has climbed the real-time ranks to the #1 spot. As you can see below, TWICE topped the real-time music charts of all the major music services with "What is Love." Congrats to TWICE and their loyal fans ONCE!